Microsoft insists that there’s just one Internet Explorer in Windows 8.1, but it has two faces — a traditional interface, similar to the one you’ve probably seen many times before; and a tiled Metro-style interface that fits right in with the tiled, full-screen, Windows 8.1 Metro experience. In some respects, the difference is a matter of semantics. Tiled Metro IE and old-fashioned desktop IE share a rendering engine — the piece of IE that pulls everything off a web page and turns it into something that you can read. The settings are shared with both faces of IE — that’s a necessity because Metro IE has very few settings available for you to change. But as you’ll see over and over again, the two browsers work very, very differently. In general use, you’ll probably gravitate to one version of IE or the other. If you spend most of your web time on a touch tablet, tiled Metro IE most likely fits the way you work. If there’s a mouse and keyboard available, you’ll end up with the old-fashioned desktop IE, more often than not. It isn’t a clear-cut decision though. Each browser has advantages. Puts the most important browsing information in your face. You can tell, at a glance, what tabs you have open and which website you’re on. Putting favorite sites on their own navigation bar is easy. You can pin sites to your Windows taskbar. Keeps all your IE settings. Just tap or click the gear icon for tools, or the star icon to set Favorites. 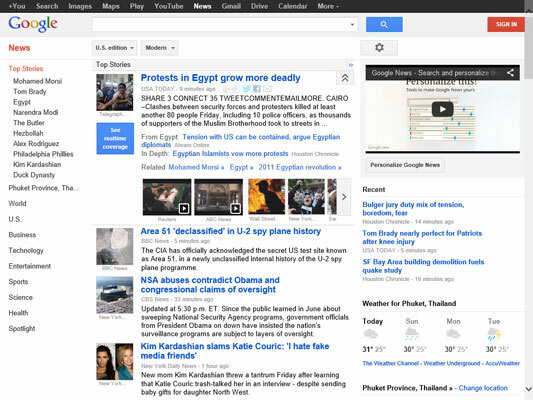 For example, setting the home page for desktop IE is easy. But you can’t set a home page for Metro IE. This part’s confusing. You can change the IE home page while working in Metro IE — swipe from the right, choose the Settings charm, then Options, and go from there. But the home page you choose doesn’t apply in Metro IE: It only applies on the desktop. There’s one exception: If you manually shut down Metro IE (drag from the top, then all the way down), the next time it starts, it’ll bring up the home page. But in every other situation, when you start Metro IE, you get the last page you had open. Lets you run all those plugins, programs, and toolbars you’ve always run. These plugins include Microsoft Silverlight, Microsoft ActiveX, Adobe Reader (so you can see PDFs just as if they were web pages), LastPass or AI RoboForm for storing and managing passwords, Bing Weather, ad blockers, Java blockers, and the Yahoo! Toolbar. The whole screen is devoted to the content of just one web page. No extras — such as the address bar, tabs, or menus — are floating around. If you’re running on a big screen, the extras probably aren’t a big deal. But if you’re on a little screen (such as a tablet), the extraneous stuff can take up a lot of valuable screen real estate. With very few exceptions, it doesn’t allow plug-ins or add-in programs, extensions, toolbars, or anything that may gum up the works. Yes, that means you can’t use Microsoft Silverlight, Microsoft ActiveX controls, the Java Runtime Environment (which Microsoft used to distribute as part of Windows), the Internet Explorer Developer Toolbar or the Bing Toolbar, (er, Bing Bar), or the MSN Toolbar. In fact, you can’t even use Microsoft add-ins, plugins, or toolbars, much less those from other companies like Ask or Yahoo!. By getting rid of all the junk (including many pieces of flotsam created, distributed, and promoted by Microsoft), Metro IE is considerably faster, more uniform, easier on the battery, and much more secure than any other version of IE, ever. Although Metro IE charges out into this brave new world of plugged plug-ins and kneecapped toolbars, the old-fashioned desktop version of IE just sails right along, as if nothing had happened. To see what that means in the real world, compare the following two figures. 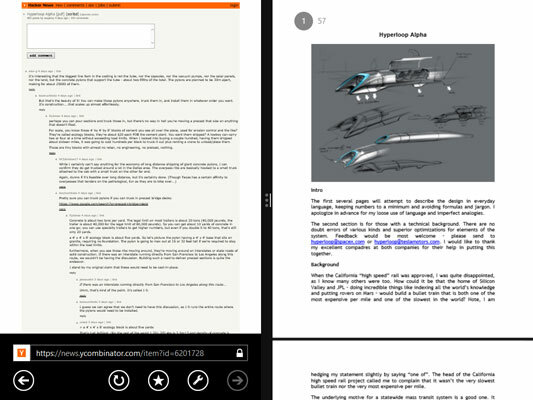 One shows a PDF as viewed in Metro IE 11 — split-screen, with the Metro Reader app. 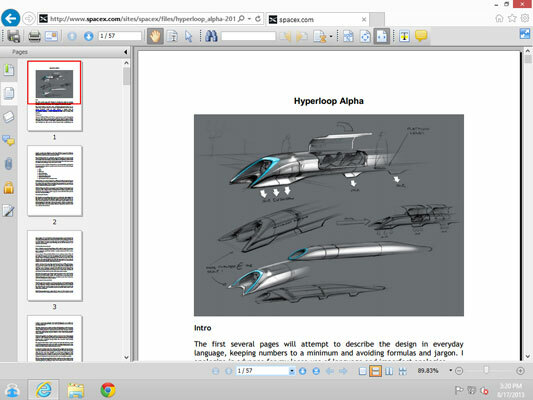 The next one shows precisely the same page viewed in the desktop version of IE 11, with Foxit Reader installed. In Metro IE, clicking a PDF file results in the Metro Reader app appearing on the right half of the screen. In the old-fashioned desktop version of IE, clicking a PDF file brings up the default PDF reader, if you’ve installed one — in this case, Foxit Reader. For now, just know that Metro IE may not handle websites the way you’re accustomed to having them handled.